Avanti is a state of the art salon and spa offering premium beauty services in Montreal. Your one stop shop for hair, makeup, skincare, spa, nails, body treatments, laser hair removal and more. Avanti Le Spa features a team of beauty professionals, renown for their talent, leadership and expertise in their fields. The Salon offers a full range of services, including; styling, blow-outs, colour services, manicures, pedicures, make-up treatments and more. Whether you are looking for a relaxing massage, a rejuvenating facial, a fresh new hair cut, voluminous blow dry, expert colourist or a glamorous makeup application- Avanti goes above and beyond to ensure your satisfaction. Avanti offers a full bridal concierge service and will go to any length to accommodate the bride and her bridal party. From spa treatments, to makeup & hair, let us take care of all the planning so you can enjoy your special day. 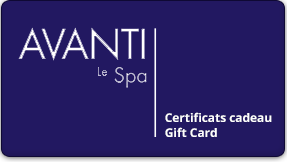 Avanti Le Spa is truly the best salon & Spa in Montreal, look no further and book your appointment today!